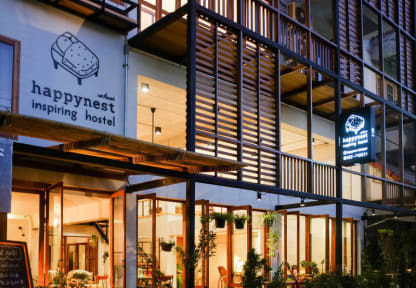 Truly located in Chiangrai city centre, Happynest Inspiring Hostel is only 5 minutes' walk from bus station and approximately 15 minutes' walk to tourist attractions such as clock tower, night bazaar and weekend walking street. It is also surrounded by hospital, gas station, post office and convenient store (7-11) is just around the corner. Good design hostel houses 10 guest rooms, consisting of 3 dorm rooms with separate bathrooms and 7 ensuite private rooms. We provide all essential facilities and amenities for both backpackers and travelers, such as free Wi-Fi, free toast and coffee/tea, several choices of breakfast, hot shower, bathroom amenities, air-con, in-room lockers, 24 hour staffs, kitchenette and a lot of common spaces.